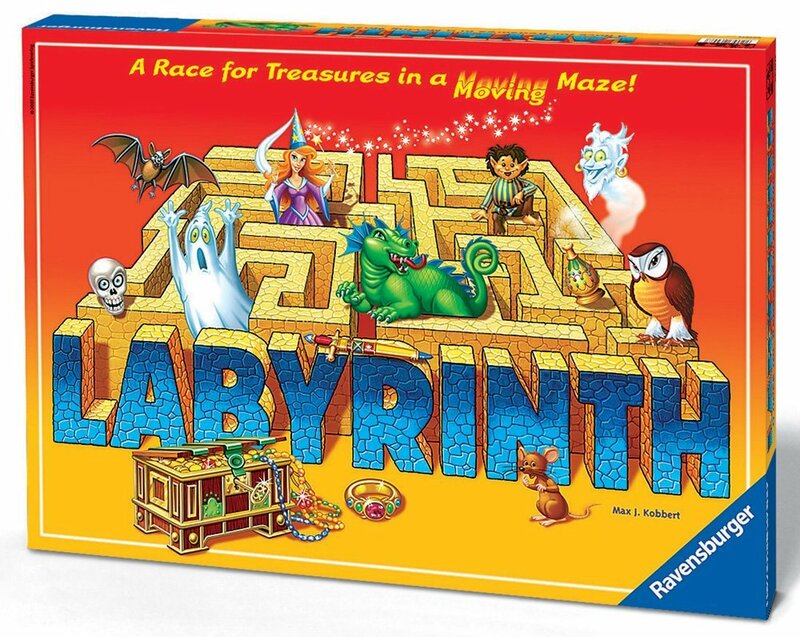 We recently reviewed Junior Labyrinth from Ravensburger and have really enjoyed playing this game (click through the game title to read our full review), and now we have a version of the original (non Junior) Labyrinth game to give away to one lucky In The Playroom reader. This will be perfect for family game nights especially in these dark winter evenings. Find the shortest route through the Amazing Labyrinth and you’ll be the victor. This game is designed for 2-4 players aged seven years and above and the aim is to reach all your allocated treasures and targets using the shortest possible route through the Labyrinth and to be the first back to the start point. But there’s a twist; the structure of the Labyrinth can change at any time as players manipulate the course to either make a path easier for themselves, or block that of an opponent. The board appears partly complete with fixed pieces of the Labyrinth. I really like Drummond Parks Logo game! No, I have never played Labyrinth but it sounds great fun! Mousetrap is my favourite. I have never played Labyrinth. We love good old cluedo which we play in teams as its a bit advanced for the children. We have played Labyrinth before but would love to own it! We all love dino bite at the moment and I have never played Labyrinth. At the moment our favourite is Monopoly, this is the first time I have heard of Labyrinth. I’ve never played Labyrinth but heard a lot about it! My favourite game is classic Monopoly! I haven’t – I like the tooth fairy game! I remember Labyrinth from years ago! Our favourite game to play at Christmas is Articulate – always has us in stitches! I love playing Bohnanza, it’s a family favourite. I’ve never played Labyrinth. ive not played this one, we love twister!! I love most but my favourite right now is Cluedo. I would be excited to play Labyrinth with the family. I played Labyrinth in German with my Austrian penpal, years ago! Favourite board game is probably Carcassonne. Monopoly. No I haven’t played Labyrinth before. Monopoly& no I haven’t played Labyrinth before. I have not played this game before – my son loves Jr Monopoly at the moment so I play this most of the time! I love Heroquest. I’ve never played Labyrinth but it looks amazing! We love Head Bands – we havent played Labyrinth before! I like monopoly, I haven’t played Labryrinth before. My favourite board game is Cluedo. I’ve never played Labyrinth but I like the look of it. Ive never played Labyrinth. I like the game of life, it was my first ever board game as a child, and its remained my favourite for all these years. My favourite is Cluedo. I remember Labyrinth being around when I was growing up but I never had it. My favourite board game is cluedo. I’ve never played labyrinth before but would like to! I’ve never played it. My fave game is Scrabble. Ive not played Labyrinth before. I’ve never played Labyrinth, or even seen it before! It looks good. We love game of life. Have never played Labyrinth, looks like my Daughter would love it. I have never played Labyrinth before. My favourite board game is Cluedo. I love scrabble we have never played labyrinth but is on my sons list for Christmas. I love Monopoly! And i haven’t played it but would like to it looks like so much fun! we have never played labyrinth before. my favourite at the moment is Hungry hippos, its just utter chaos. The Game of Life is my favourite board game. I’ve never played Labrinyth before, no. My favourite game is Sorry!. I have never played Labyrinth. My favourite board game is Trivial Pursuit 🙂 Never tried Labyrith, it looks like fun though! I have played Labyrinth and it is a super game which the whole family can enjoy. I would love to have one of my own! I like Labyrith as have played it at a friends house.